The Buddha included non-human animals along with humans in the class of beings that are deserving of our compassion and non-harming action. The Western spiritual tradition – at least in its mainstream formulation – works on two levels of morality: a higher level that governs our treatment of human beings and a lower level that governs our treatment of animals. Thus, it seems to be morally acceptable to enslave animals for labor and entertainment and to imprison and slaughter them for food, fabric, and for medical research, while it would be morally repugnant to treat human beings the same way. Mainstream Western compassion protects the core interests of human beings while only tinkering around the edges of animals’ lives and suffering. We in the twenty-first century Western Dharma community have often lost sight of the enormity of suffering we cause to non-human animals, most of which can be easily avoided. So many of us routinely eat meat, chicken, sea animals; wear animal products as clothing; and use personal hygiene and household products tested on animals or containing animal products. Sadly, most of the Dharma Centers have not set a good example. 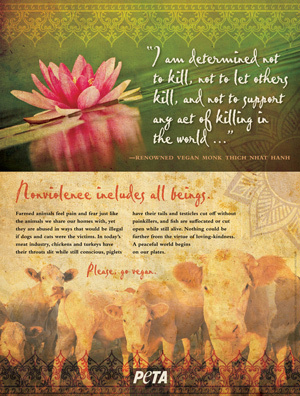 We at DVA hope to bring awareness to the suffering of animals caused and supported by our Community and Dharma Centers, provide reasonable alternatives to the actions that cause and support the suffering, and advocate on behalf of the animals for changes that will significantly reduce that suffering.